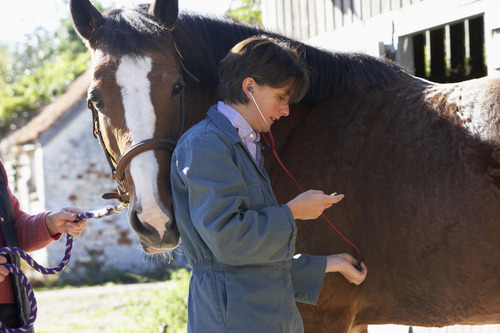 Veterinarian examining a horse during a pre-purchase exam. In 2012, Equine Legal Solutions conducted a survey to examine horse sale practices. An astonishing 67% of respondents had previously purchased a horse they believe was misrepresented. And the respondents were far from unsophisticated - 21.6% were trainers or other equine professionals, 28% were "expert amateurs," and 41.9% were "knowledgeable." Only a small handful of respondent s described themselves as a "novice" or "beginner." No matter the cost of the horse, a pre-purchase exam can reveal problems that you should consider before buying. Clearly, a thorough veterinary pre-purchase examination would have revealed many of the problems before the buyer purchased the horse: soundness (35.6%), health (17.6%), age (12.4%), conformation issues (10.8%), pregnancy status (8.2%), breeding soundness (4.9%), and eyesight (2.3%). However, the majority of respondents who purchased a misrepresented horse said they didn't have a veterinary pre-purchase examination. Why not? The most popular answers: they "trusted the seller," the horse was "inexpensive," and a pre-purchase exam was "too expensive." Clearly, the buyers' trust in the sellers was misplaced. But how about the other reasons these sophisticated horse buyers didn't get a pre-purchase exam? The purchase price of a horse is often the least expensive part of horse ownership. Although the majority of respondents paid less than $5,000 for the misrepresented horse, a significant proportion of those respondents said they lost more than $5,000 on the misrepresented horse. Where did that money go? 44% of respondents said they spent money trying to diagnose and/or treat the misrepresented horse's physical problems. 35% had to resell the horse at a loss, 12.8% had to give away or donate the horse, and 5.5% had to euthanize the horse. And then there is the emotional cost of buying a problem horse: Half the respondents said the situation caused them stress, and a handful of respondents gave up on horses altogether. Pre-purchase exam - is it worth the cost? Is a pre-purchase exam really "too expensive?" Nearly half the respondents who said they had a pre-purchase exam paid less than $500 for it, and another third paid between $500 and $1,000. Doesn't seem like much in the context of potential losses, does it? Beyond avoiding buying a misrepresented horse, there are other economically sound reasons to have a veterinary pre-purchase exam. The horse might have a health or soundness issue that the seller doesn't know about. Not every seller is knowledgeable and observant. Or, the seller might have noticed the issue, but not considered it significant enough to mention. If you find out before you buy, you can save yourself a lot of money in vet bills down the road. Possibly, the pre-purchase exam results reveal a problem that isn't a deal-breaker, but lowers the horse's fair market value. You can ask the seller to lower the purchase price accordingly, and if they refuse, you can walk away, having avoided overpaying for the horse. Finally, when you do go through with the purchase, having a thorough pre-purchase veterinary exam provides a good baseline assessment of what your horse's health and soundness was when you bought him. That way, if problems develop down the road, your veterinarian will have good historical data for comparison. ELS’ founder and owner, Rachel Kosmal McCart, is a graduate of Duke University School of Law with over 15 years of legal experience. Rachel is a member in good standing of the Oregon, Washington, California and New York bars, and is admitted to practice before the U.S. District Court for the District of Oregon. Prior to founding Equine Legal Solutions, Rachel was a corporate lawyer at Donovan, Leisure, Newton & Irvine in New York and Cooley Godward, LLP in the San Francisco Bay area.